Heat oven to 375°F. In 10-inch nonstick skillet, melt butter over medium heat. Add onion; cook 5 minutes, stirring occasionally. Add mushrooms; cook, stirring occasionally, until onions and mushrooms are tender. Reduce heat to medium-low. Add wine, rosemary and thyme; cook 4 to 5 minutes, stirring occasionally, until liquid has evaporated. Remove from heat. 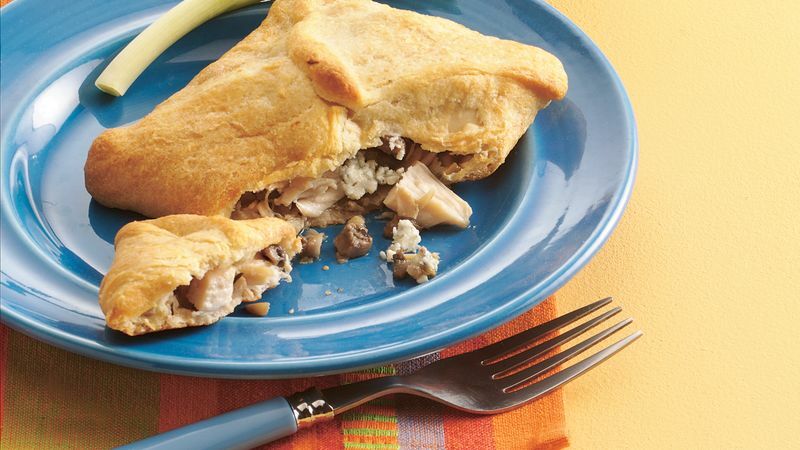 Stir in chicken and blue cheese. Separate dough into 4 rectangles; press or roll each into 5-inch square, firmly pressing perforations to seal. Spoon about 1/2 cup chicken mixture onto center of each dough square. Bring all 4 corners of dough up over chicken mixture; pinch seams to seal. Place on ungreased cookie sheet. Bake 11 to 14 minutes or until crust is golden brown. Spoon 1/2 cup chicken mixture onto center of dough square. Bring all 4 corners of dough up over chicken mixture; pinch seams to seal.